The Bills defeated the Jets on Thursday, 22-17, after topping the Dolphins on Sunday. Entering tonight’s game, Rex Ryan had lost 18 of his previous 20 games immediately following a win. No other coach in NFL history has ever had such a low winning percentage over a span of 20 post-victory decisions. The Bills have won four straight games against the Jets, in which they haven’t committed a turnover, while the Jets have committed 15! Only two other teams in NFL history have piled up 15 or more takeaways without a turnover over a four-game span against one team. The Colts were plus-16 against the Ravens from 2004 to 2008 and the Dolphins had a plus-15 differential against the Patriots from 1967 to 1969. Karlos Williams caught a touchdown pass from Tyrod Taylor on Thursday, and he’s now scored a touchdown in all six games he’s played in the NFL. The only player in league history who scored a TD in each of his first six games was Robert Edwards for the Patriots in 1998. Edwards was drafted 18th overall in 1998 by New England and rushed for 1115 yards as a rookie, but he injured his knee in a flag football game during the Pro Bowl festivities at the end of that season. He didn’t play another NFL game until 2002, with the Dolphins. History says the Patriots, Bengals and Panthers are all in good shape for the playoffs. Since the NFL switched to a 16-game format in 1978, 16 other teams have started 8-0. Of those teams, 12 won at least one playoff game, nine reached the Super Bowl and six won the championship. 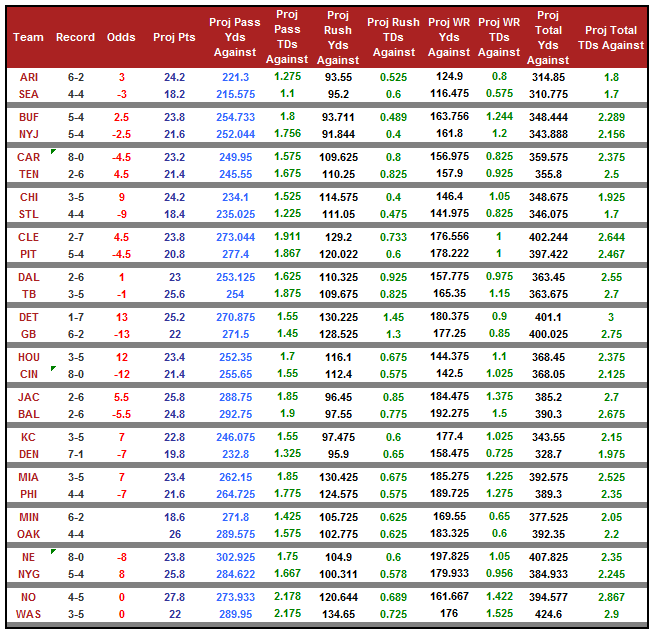 Also, of those 16 teams, 15 won their next game but went just 8-8 against-the-spread. Games Matching this Criteria: Patriots (-7) @ Giants, Bengals (-10.5) vs. Texans and Panthers (-4.5) @ Titans. All-time, teams that have won eight games in a row and are favorites of ten or more points in the next game went 11-8 against-the-spread. Games Matching this Criteria: Bengals (-10.5) vs. Texans. The last ten teams to lose three straight against-the-spread and then be installed as home favorites the next week went 3-6-1 against-the-spread. Games Matching this Criteria: Packers (-11.5) vs. Lions and Steelers (-4.5) vs. Browns. AZ +3 @ SEA Carson Palmer is 4-1 against-the-spread as an underdog of less than a touchdown with the Cardinals. BAL -5.5 vs. JAX The Ravens are 1-8-1 against-the-spread in the team’s last ten games as favorites. BUF +2.5 @ NYJ All-time, the Bills are 2-6 ATS on Thursday Night Football. CAR -4.5 @ TEN Cam Newton has won eight games in a row but in his career as a road favorite he is just 5-5-1 ATS. CHI +7 @ STL Jay Cutler is 4-1 straight-up in his career against the Rams, but the one time he was an underdog (last year) he lost and failed to cover. CIN -10.5 vs. HOU The Bengals are 3-7 against-the-spread in the last ten games as home favorites of 10 or more points. CLE +4.5 @ PIT The Browns have covered in five of their last six games following an appearance on Thursday Night Football. DAL +1.5 @ TB This is just the fourth time the Cowboys have lost six straight, the previous three times Dallas lost the next game as well. DEN -6 vs. KC In the Peyton Manning era, the Broncos as home favorites of a touchdown or more are 20-3 straight-up and 12-9-2 ATS. DET +11.5 @ GB Matthew Stafford is 0-5 straight-up all-time on the road as a dog of ten or more points and 1-3-1 ATS. GB -11.5 vs. DET Aaron Rodgers is 18-1 straight-up and 11-8 against-the-spread as a home favorite of ten or more points. HOU +10.5 @ CIN The Texans will likely lose in Cincinnat: all-time as touchdown or greater underdogs, Houston is just 11-41 straight-up. JAX +5.5 @ BAL Did you know the Jags have a winning record against 11 NFL teams? They also have a winning record against teams coming off a bye (9-8). KC +6 @ DEN All-time, the Chiefs as touchdown or greater underdogs in Denver are 2-14 straight-up but 9-7 ATS. MIA +6 @ PHI The Dolphins are in danger of falling out of the playoff race, Miami has lost its last five road games as underdogs. MIN +3 @ OAK The Vikings are currently the 5th seed in the NFC but Minnesota has only won four of its last 20 road games as an underdog. NE -7 @ NYG Tom Brady is just 2-8 against-the-spread in the last ten games as road favorites of a touchdown or more. NO -1 @ WAS Drew Brees and the Saints have covered just twice in the team’s last ten games as road favorites. NYG +7 vs. NE Eli Manning has never won a game as a home underdog of a touchdown or more (0-5), but he is 3-2 ATS in those games. NYJ -2.5 vs. BUF All-time, as home favorites against the Bills, the Jets are 8-16 against-the-spread. OAK -3 vs. MIN Since 2002, when the NFL expanded to 32 teams, the Raiders are 17-27-1 ATS as home favorites. PHI -6 vs. MIA All-time, the Eagles as home favorites against the AFC are 22-38-1 ATS. PIT -4.5 vs. CLE In nearly 40 years of football, the Steelers have only lost three times as home favorites against the Browns – the last time was in 2003. SEA -3 vs. AZ The Seahawks are 16-9-2 ATS as home favorites with Russell Wilson. STL -7 vs. CHI In the last 20 games that the Rams have been favored by a touchdown or more, St. Louis is 6-14 against-the-spread. TB -1.5 vs. DAL The Bucs are just 2-8 against-the-spread in the last ten games as favorites. TEN +4.5 vs. CAR All-time, the Titans as home underdogs are 58-44-3 (57%) against-the-spread. WAS +1 vs. NO Kirk Cousins is 5-12 straight-up as a starter and 7-10 ATS.